200 x 85 LLC has announced its highly successful BODY CONTACT clinics this coming March. 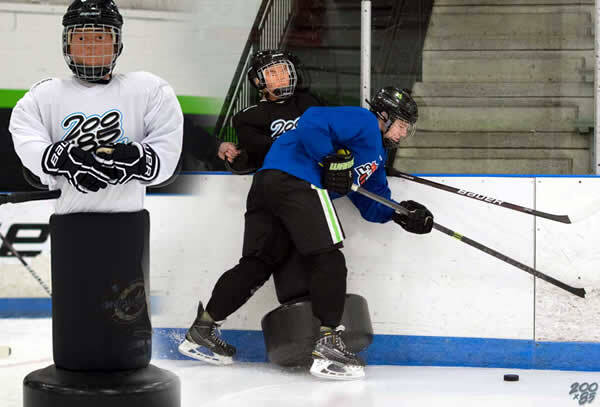 The clinics are one of a kind with “Checking Dummies” that provide players with an opportunity for professional instruction on the skills of awareness, angling, body position and body contact. Each session focuses on helping players develop their confidence in physical situations and reduce the likelihood of injury. For $175.00, players will receive at least four hours of on-ice instruction over a two-day period. Every player will understand the importance of checking skills and improve them in station based sessions maximizing repetitions by emphasizing proper technique and hitting with a purpose. Clinics will be held at Seven Bridges Ice Arena. Each clinic will be limited to the first 35 travel hockey participants. Please remit payment payable to 200 x 85 LLC.